Whole30 vs. Paleo: What's the Difference? 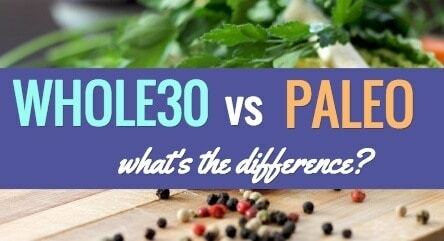 / Whole30 vs. Paleo: What’s the Difference? Whole30 and Paleo are two eating regiments that are very similar. In fact, in a nutshell, Whole30 is simply a more strict version of Paleo. Whole30 and Paleo are almost identical in their ideology. In fact, all Whole30 recipes are also Paleo friendly, but not all Paleo recipes can work on the Whole30 diet (although many can). Logistically, Whole30 and Paleo are almost identical. The major practical difference between Whole30 and Paleo is that Whole30 doesn’t allow any kind of added sugar, while Paleo only rules out refined sugar (so for example, you can have honey with Paleo, but not with Whole30). As a side note, one other small difference is that Whole30 advises against trying to imitate your favorite baked goodies or junk food with approved ingredients (so imitation pancakes would be off the list). However, it’s common (and encouraged) for Paleo eaters to recreate their favorite sweets with ingredient adjustments. The biggest difference between Paleo and Whole30 is the form of how each diet is carried out. Whole30 is designed to be a very strict 30 day program to cleanse and reset your body. While some of the habits you gain from Whole30 will hopefully be maintained, it isn’t intended to be a permanent practice. Most of the benefits from Whole30 diet come from learning about your relationship to food and discovering how to modify unhealthy eating habits. Paleo, on the other hand, is a long-term eating lifestyle. Since it’s designed to be long-term, rules are a bit more relaxed. Many Paleo eaters also think of Paleo as a loose template – some will add in dairy or or alcohol here and there. Paleo is more a general mindset, and with so many modifications, people often define a Paleo lifestyle differently. Many individuals use Whole30 as a launching pad into a more long-term Paleo lifestyle, or to reset their eating habits when they’ve strayed too far from the Paleo practice. Ultimately, the two programs resemble one another very closely. The main difference lies in the diet’s form. Bone Broth Benefits: Is Bone Broth Good For You? Is fish allowed on Whole 30 or Paleo? Says Meat/Veggies/Fruit for Whole 30…looks kinda the same w/Paleo….so would like to know if Fish or Shellfish allowed. Yup, all fish and shellfish is fine. Yeah pretty weird. Most folks do verify that potatoes are good for you. No reason why you shouldn’t have them on a modified paleo diet. I’ve done the whole 30 with total compliance. I’m proud of that. I am trying to live the Paleo lifestyle but I do find after about three months I start slipping back. Not much, but enough that I definitely will do whole 30 every year just to relaunch. Is cloud bread allowed on either plan? Nope – no dairy allowed on either! This was really helpful. I was trying decide between the two and I love the fact that the whole 30 does the cleanse and gets your mindset where it needs to be. I love fruit, and yogert I am looking, for something whole 30 to snack on. What can I do since dairy isn’t allowed?